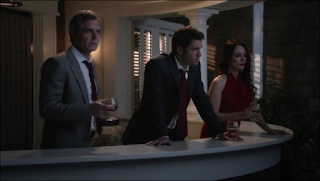 Beyond Fandom: 'Revenge' 214 Review - "Sacrifice"
'Revenge' 214 Review - "Sacrifice"
Tonight’s episode of Revenge was the one we’ve been speculating about since the season premiere. We find out how The Amanda sunk and whose arm is floating in her wreckage. It was easy enough to tell who the arm was going to be for several episodes now and they did pull another Tyler--he was even a criminal as well--by having the arm belong to someone we didn’t meet until later in the season. Unlike season one however,they added another death to the toll someone much more important to the story. Amanda met her end tonight, she died in the arms of Emily after she shoved her away from the boat’s explosion. It is fitting that Amanda went down with The Amanda, but did she really need to be stupid and head back to get the necklace while propane was leaking? That may not have been the brightest move ever, but the fact remains that Amanda continued to prove she’s willing to sacrifice everything for the people she loves. Be it through murder or pushing them onto a raft and staying behind with a gun (and lighter) wielding psycho. But in the end Amanda was always the most devoted to Emily. Let’s face it folks, she was in lesbians with her it’s just more convenient to call it a sistermance. At the end of it all, she gave up not just her own name but her life in the name of Emily’s quest for justice and revenge. Hopefully her death is going to put Emily’s sights back where they belong: on the Graysons. It is in fact their fault the Ryan brother got onto the honeymooners’ boat, but when news of her death reaches back to Grayson Manor they’re all going to assume they played an even larger role in it. After Victoria popped a cap in Helen in the last episode they knew they’d need a fall guy. Like her father before her, Amanda followed the family tradition of filling that role for the Grayson family. 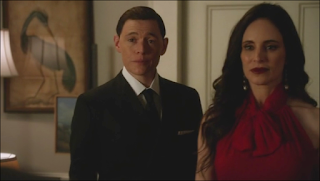 Evidence was planted and a song and dance was given to the new Initiative guy, played by Torchwood’s own Burn Gorman. I’m sure the Initiative is going to enjoy the happy accident that they didn’t have to take out Amanda themselves, but I’m sure that they’ll keep the Graysons thinking that they did. Victoria and Conrad will take news of the death in stride but the real drama is going to come from how Daniel copes with what he believes they’ve done. Will he fall in line and be the Grayson son he was always destined to be? 'The Vampire Diaries' 415 Review "Stand by Me"
'Cult' 101 Review "You're Next"
'The Vampire Diaries' 413 Review: "Into the Wild"